Let’s be honest NetSuite is a great platform, it allows you to do anything you need to run your business successfully, no matter what industry you are; manufacturing, retailing, servicing etc NetSuite has your back. However, since NetSuite is a proprietary system, the limitations to access the database and some of the system resources are limited to whatever the system was designed to do, the SuiteScript API and SuiteCloud API. Therefore, you will encounter that one of the shortfalls using NetSuite is the ability to delete records in bulk. So make sure that your CSV import jobs get tested correctly or you will be spending lots of time clicking, selecting rows and deleting (phew my finger hurts). Yes, you have the option to delete records by hand; by selecting a cell that supports editing and pressing shift, you should be able to select the rows you want to delete; but this is not deleting records as a pro, this is more like deleting records as a user. I have seen this process deleting around two, three thousands of records in less than one hour and around ten thousand in three to five hours. It works pretty well. I can’t tell you how many times this script has been helpful during an implementation, data migration or some other process, for me or a member of my team. To delete more complex data like transaction and its related records, contact us. 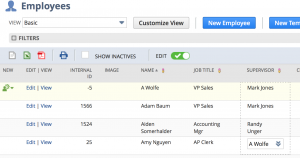 0 Comments on "NetSuite – Deleting Records like a pro"